Ellie Markovitch recently moved to Maine with her husband, two children and dog Kora. She applies her passion for innovative and sustainable food practices and her unique skill set that includes visual and social media storytelling and community engagement. Ellie has a professional background in photojournalism and an MFA degree in Electronic Arts. She is also a skillful cook. Her work revolves around media and food literacy. 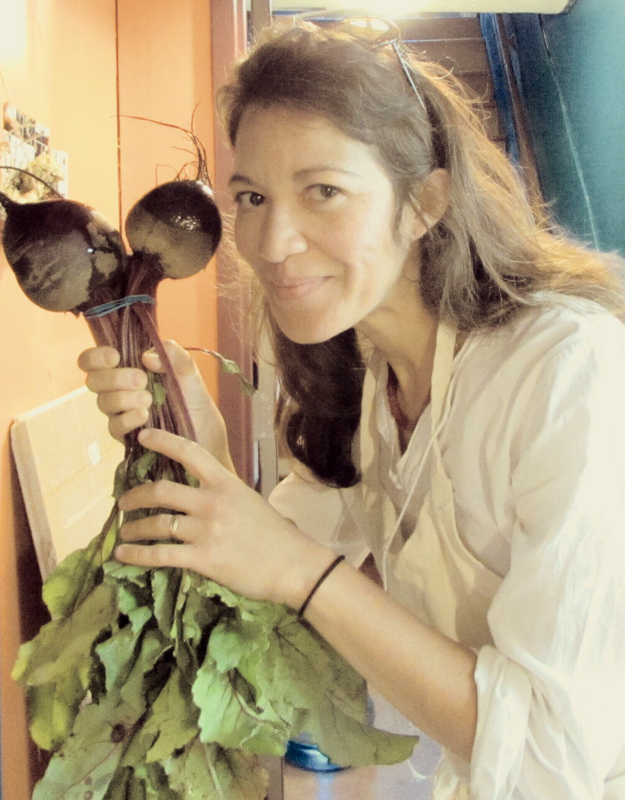 She uses food as a starting point for conversations and community building. As a member of the Chefs’ Consortium of New York State, she helped develop and deliver programs that raise awareness of the local food systems. While in Upstate New York, she also developed and ran educational programs in collaboration with local organic farmers and the Agricultural Stewardship Association. You can see samples of Ellie’s work involving food preparation and visual storytelling at https://www.instagram.com/elliemarkovitch/ and at https://storycooking.com/. She was born in Brazil and spent most of my childhood weekends at my grandparents’ small farm. There was a story behind everything we did with our food – from how it was harvested, cooked, and shared. This site is a place to capture reflections on the roles of food in our lives, the impact of food on community, and explore people’s relationships with cooking and eating. It was great to talk with you and Rose at last month’s Troy Night Out, here is a link to the report. Our conversation starts at the 16:45 point of the 80 minute report and runs for about 13 minutes. Take care, see you soon. This month’s episode is ALL about the Arts Center of the Capital Region, the nerve center of downtown Troy, and its wealth of exhibits, classes and workshops. Sitting in on Julie Gutmann’s poetry and memoir class reading, we listen to a harrowing, metaphorical exploration of brain damage and a wistful evocation of the joys of cabaret… partake of the chocolate cupcake decoration assignment… view Charles Steckler’s whimsical drawings… help Claire Sherwood fill the gallery walls with tissue paper flowers… celebrate “National Play the Recorder Month” at Segel Violins… get an inkling of what a life of “nonstop awesomeness” would be like… talk with David Chura about the misconceptions and thorny issues surrounding incarcerated youthful offenders… and ease into the night with the smooth jazz of the all-new Keith Pray Soul Jazz Revival. I love the premise of your site, great idea! I agree with you the cooking is like a story. I just read recently where one author pointed out that most recipes are like stories, there’s a beginning, middle, and end. Oh, super– thank you Jon! I appreciate so much. I can’t wait to see what you are cooking next! What comes around goes around Ellie! I had no idea you had a blog, but now that I do, I shall be happy to pitch into your food and photography adventures whenever I can. You know Shyam and I love food, I love cooking, and we both love art, storytelling and listening. Looking forward to some fun times together. Parabéns Ellie! Você é uma pessoa especial!